Appearing: Saturday, April 9th at House Of Blues in Chicago. So explains Ville Valo of Finnish love-metal act H.I.M., in regards to his new and (comparably) optimistic outlook. It’s an almost-hopeful sentiment present on his band’s seventh album, Screamworks: Love In Theory And Practice (Sire). It’s also surprisingly (and again, comparably) positive coming from a band with song titles like “Dead Lovers’ Lane,” “The Funeral Of Hearts,” “Join Me In Death,” and “Love In Cold Blood” and albums like Razorblade Romance and Greatest Love Songs Vol. 666 in its catalog. 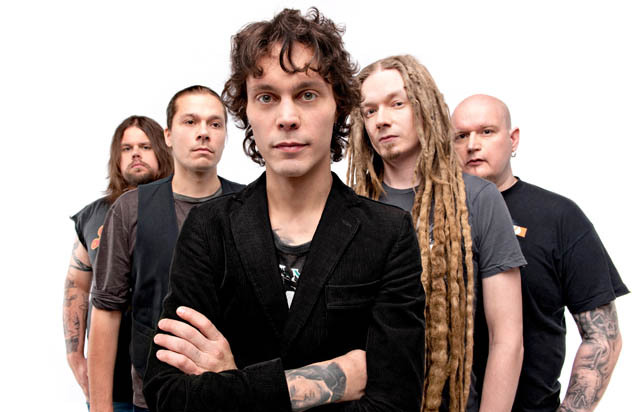 But then, as Valo explains, Screamworks aims for more than just the group’s previous doom-and-gloom ambitions. It’s a description that easily applies to the electronic-tinged and morose “The Foreboding Sense Of Impending Happiness,” while the harder-edged “Like St. Valentine” would fit right in at modern-rock radio. Yet songs like the more pop-laced “Scared To Death” and power ballad “In The Arms Of Rain,” while instantly recognizable as H.I.M. fare, demonstrate an urgency and impact present in much of Screamworks and new to the group’s sound at large. No doubt the album’s newfound dynamic can be traced back to the band recording the album in Los Angeles, with production from Matt Squire (Panic At The Disco, Taking Back Sunday) and mixing by Neal Avron (Fall Out Boy, Weezer). And according to a Billboard.com interview from December, Screamworks is the first album Valo has written entirely sober, a fact that plays into the album’s heightened directness, as well. Yet the reason for the singer’s sudden sobriety was (unsurprisingly) far from a happy one. In addition to being a very real and dangerous threat, the frontman’s risk of heart failure is hugely ironic, given the heavy and repeated use of broken and battered hearts in H.I.M.’s lyrics and imagery. In fact, the group’s most recognizable aspect is its “heartagram” logo, a design that combines a pentagram and a heart. The irony was not lost on the singer. A surprising sentiment from such a somber and sordid soul. Yet with the retreat from excessive drinking and the time spent among sunny, palm tree-laden landscape of L.A., is it any wonder Valo sees a light at the end of the tunnel, be it train or otherwise? “On a philosophical level, I think that the journey is way more important than actually getting there. I think that happiness is actually trying to get to happiness,” he states. “I don’t think that a psychological/mental/emotional equilibrium is heaven. That’s hell. Sitting on top of a cloud playing a harp for eternity, [is] definitely not my idea of paradise. That feels really repetitious and like a bad dream, so I think that happiness in itself for me is the fact that, I’m trying to go forward with the band, musically, I’m trying to become a better person, doing what I do, as everybody’s doing. 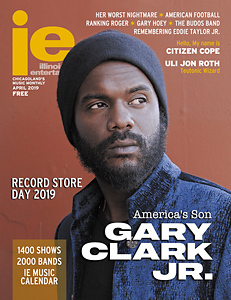 For the full interview, grab the March issue free throughout Chicagoland. The Official WB HIM Illinois Street Team is excited about the upcoming concert in Chicago !! The House Of Blues is a great venue and we expect a huge turn out of both old and new fans. HIM’s 7th album, “SCREAMWORKS – Love In Theory In Practice” is in stores now !!! Feel free to join our Official Street Team (HIM’S PARATIISI I&II)on Myspace, Facebook and YouTube, or follow us on Twitter) or @Heartagram.com for all the latest news, interviews, photos, videos and confirmed concert dates. Find me (Lisa Valo) at the House Of Blues on April 9th and win a free HIM poster.